Beyond Compare Standard edition ($30) is a powerful utility for tracking down differences between files and folders. Its feature set is comparable to free and open-source WinMerge, with a few added extras such as comparing images and music file metadata, and support for comparing files over FTP. 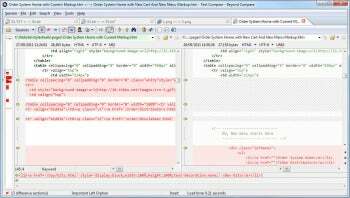 Beyond Compare supports syntax highlighting and can be used to compare HTML documents. Beyond Compare's interface is straightforward and easy to understand. It uses tabs, so you can have several compare sessions at the same time. Each session compares two folders or two files of the same type. Each file or folder compared gets a pane, and you can browse the two panes to see the differences. The first thing I tried to do with Beyond Compare was compare two versions of a scholarly text. It tracked down the differences, but the interface made it difficult for me to find them: Beyond Compare does not support word wrapping. This means each lengthy paragraph in my article got just a single line, and I had to keep scrolling horizontally to see the rest of the line. Not very convenient. Beyond Compare's MP3 comparison feature only goes into metadata, not actual sound. I got better results comparing HTML. My file did not have overly long lines--and I use a widescreen monitor--so the manual line breaks in the file itself were enough to make it readable in Beyond Compare. I could easily see the differences between two versions of the same HTML file, and merge them any way I wanted to. Beyond Compare also has a feature for finding differences between image files. I tried it with two PCWorld logo files I found online. It was no surprise that Beyond Compare confirmed that the files were absolutely identical. Then I made them different with a simple tweak, just shifting one file on its canvas. Beyond Compare visually highlighted the differences, showing where pixels didn't match in the two files. Beyond Compare's image comparison feature works visually, letting you see which pixels are different. Unlike the image comparison feature, MP3 comparison did not go into the actual sound data stored in the files. 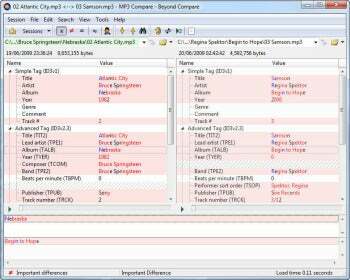 Beyond Compare simply laid out the metadata (ID3 tag) for each of the files, and showed me the differences. This is marginally useful, but if you are serious about your MP3 metadata you are better off using the free (and excellent) MusicBrainz Picard. Beyond Compare was fast and responsive when I tested it, and the features worked as described. That said, unless you need some of its more exotic features such as FTP support, you may get similar results using one of the free alternatives.